This epoxy floor coating hides repairs made to a badly cracked floor. The epoxy patch material was ground flat with the rest of the floor so the coating would be smooth. A decorative concrete floor is almost never really finished until it is sealed or coated. A coating protects the concrete and its colors from wear and contamination. Coatings can even add an extra decorative dimension. Epoxies are widely used by themselves or with other materials to coat concrete, and they have a long track record of success. Popular for their adhesion, hardness, chemical resistance and versatility, epoxies are usually two-component materials, composed of a part A resin and part B hardener. "They were originally designed as adhesives and are primarily derived from petroleum-based chemicals," explains Paul Koury, president of Westcoat Specialty Coating Systems. Epoxies can be formulated into 100 percent solids materials or water-based emulsions, which are usually composed of 40 percent to 60 percent solids, Koury says. Materials that are 100 percent solids can typically be thinned using an appropriate solvent when a lower-solids material is required - for example, for use as a primer. 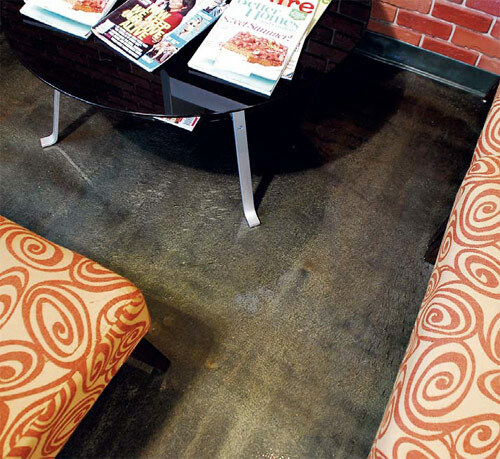 Epoxy floor coatings are coming out of the garage and into showrooms, restaurants and commercial spaces like this hair salon, where beauty, durability and chemical resistance are high priorities. Reducing the solids percentage does not reduce chemical resistance and durability, Koury says - but it does change wetting characteristics, and since the lower-solids material soaks in deeper, it can improve adhesion of the coating to the concrete. 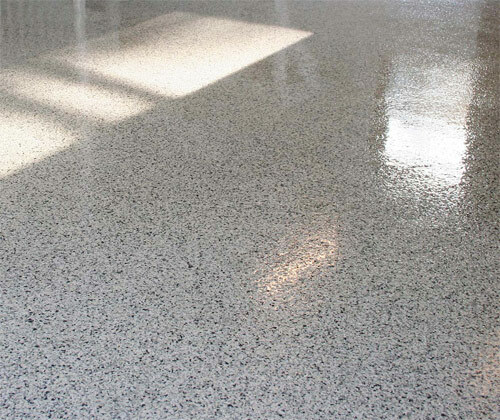 Lower-solids clear epoxies can be used as sealers. "A coating and a sealer differ in the thickness of the material applied," Koury says. "And epoxy makes an ideal sealer due to its excellent adhesive qualities, its chemical resistance, its durability and its ability to create a wet look' finish." Lonnie Salyers, director of floor coatings for General Polymers, explains that the epoxy molecule is too large to penetrate concrete pores, but the material seeks imperfections and adheres tenaciously to seal the concrete. "Sealers are typically low solids materials which provide little film build. Sealers are typically applied at 1 to 5 mils wet film thickness, and coatings can range from 5 to 30 mils wft and are much higher in solids." Contractors can manipulate this pigmented epoxy floor coating from Thermal-Chem Corp. to create a look similar to that of acid stain. Unlike stain, this opaque coating hides flaws in the floor. Photo courtesy of Thermal-Chem Corp.
Chemical resistance is the reason epoxies became so popular for garage floors in the 1970s. The same quality makes them a good choice for food preparation areas, pharmacies, factories - any place where oil, acid (think lemon juice) or other reactive contaminants might hit the floor. One of the strengths of epoxy is also its weakness. The material is very hard, which makes it very durable. But unlike softer coatings, hard epoxies show scratches, so they can lose their gloss with traffic. Epoxy's adhesion properties comes to the rescue here. Epoxies adhere well to other materials, so a topcoat of urethane or maintenance coatings of acrylic or wax can be used to protect the gloss. In the worst case, the coating can be repaired successfully. "Sometimes you have to grind out a section and replace it, but generally epoxy is pretty forgiving," says contractor Craig Adamson, owner of Special Effex, based in Machesney Park, Ill. "You can make a nice repair job look like it was never there." 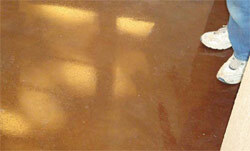 Perhaps the biggest limitation of epoxy coatings is their tendency to amber with exposure to sunlight. As a result they are not recommended for outdoor applications. Even interior light can eventually discolor an epoxy coating. To take full advantage of an epoxy coating's adhesive qualities, a concrete floor needs to be prepared properly. Ken McKinnon, president of McKinnon Materials, recommends shotblasting, sanding or grinding the concrete. Acid washing can leave a residue that will impair adhesions. Also, the high gloss of epoxy can telegraph the flaws of underlying concrete, he says. One solution is to apply a scratch coat or skimcoat of acrylic polymer-modified concrete before installing the epoxy. The floor also must be sufficiently cured and dry to avoid bubbling or chalking caused by moisture escaping the concrete. McKinnon cautions that a moisture meter only measures the moisture at the spot where it is used, which is not necessarily consistent throughout the whole floor, so multiple meters may be necessary. He prefers the old-fashioned moisture-test method of taping plastic over sample areas of the slab. "If there is moisture on the plastic and the concrete the next day when you pull it up, it's still too wet," he says. The look of a terrazzo floor at this retro diner was achieved with an epoxy floor coating. Because two-component epoxies cure by chemical reaction, not by drying the way paint does, contractors need to handle them properly for the best application and end performance. The biggest issue is pot life. The chemical reaction that cures the coating begins in the bucket as soon as the two components are mixed. The applicator must plan to be able to use the whole batch before it cures. Pot life varies from 10 minutes to two hours according to McKinnon, so contractors need to be familiar with the limitations of the particular material they are applying. Once the two components are mixed, he says, "If your phone rings, don't answer it!" Proper mixing is also important, and pot life plays a role here as well. If the same bucket is used to mix one batch of epoxy coatings after another, the pot life of each will be shorter than the last. Justin Brazie, product manager for H & C Concrete Coatings, explains that this is because the residue of the earlier batch reduces the pot life of later batches. For example, if a coating with a pot life of two hours is used in half an hour and the same bucket is used to mix the next batch, the new material will only have a pot life of an hour and a half. The chemical reaction that cures the material also generates heat, so the bucket gets hot as the pot life expires. This heat shortens the pot life of the next batch mixed in the same bucket. McKinnon recommends changing the mixing vessel periodically and keeping the material in the shade, as cool as possible, to prolong pot life. Craig Adamson recommends getting the coating out of the bucket as quickly as possible. "Ribbon it out on the floor right away so you have more working time with it," he says. "Epoxies set up fast, so your work time has to be planned out in advance. You should have everything ready so the epoxy can go down right away. We only mix enough to work for about 10 or 15 minutes at a time." Contractors also need to be sure they mix the two components in the correct, manufacturer-directed ratios and agitate the mixture adequately. Some formulations need to be mixed, left to rest and then mixed again. Finally, the elimination of solvents from 100 percent solids formulations because of VOC concerns has narrowed the temperature range at which epoxies can be applied. Lower temperatures make the mixed material thicker and thus harder to apply and level. As high-performance coatings become more commonplace in decorative applications, so do the problems associated with using them. Unlike acrylic sealers, high-performance coatings (polyurethane, epoxy, polyaspartic and polyurea) are not as forgiving when it comes to application, or more specifically, reapplication.